As you know from reading our posts, Shannan and I wholeheartedly subscribe to a whole foods diet. We try to introduce ideas and recipes that encourage you to choose natural, unprocessed foods full of the most nutrition possible. One of the reasons for this is that convenient, processed foods contain a lot of harmful food additives. It's hard to say which one is the worst, but one I'm becoming more and more concerned about is MSG or mono sodium glutamate. 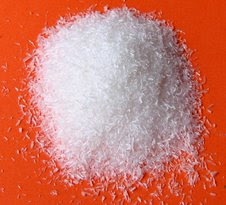 MSG is used as a "flavor enhancer" in many pre-packaged foods and even in restaurant prepared foods. It's found mostly in meats, canned soups, crackers, chips, salad dressings, and frozen dinners. Now, even before you understand the danger to your health that MSG can pose, it's use as a "flavor enhancer" should bring one pause. I mean, if the food needs a "flavor enhancer" what's wrong with it? Fresh, nutritious food usually tastes pretty good on it's own. What kind of low quality, stale, non-nutritious food needs a "flavor enhancer"? MSG actually has very little actual flavor. It's a chemical that tricks your tongue into thinking that the food you are eating has more protein and tastes better. MSG can also overstimulate heart muscle leading to cardiac arrhythmia's and death. This may in part explain some of the sudden deaths seen in young athletes. Increased insulin production: To study diabetes, scientists had to create obese rats. To do this, they injected the rats at birth with MSG. They found that MSG triples the amount of insulin the pancreas creates, causing the rats to become obese. Avoid eating foods with labels as much as possible. If a food is processed you can almost assume it contains MSG. Eat foods prepared in your own kitchen where you know what has been added to your food. If you eat out, ask your server at restaurants if their food contains MSG. Ask that they prepare your food without adding MSG. Fast food restaurants are notorious for adding large amounts of MSG. Check all food purchased for any of these listed names of MSG - hydrolyzed protein, textured protein, glutamate, glutamic acid, sodium caseinate, calcium caseinate, yeast extract, autolyzed yeast, and the general "seasonings". It's scary to me to think that an additive in foods can have such a dramatic impact on my health and the health of others. Join me in avoiding MSG. Check out the ingredient decks on foods in your pantry and remember to carefully check labels next time you are at the grocery store. Even better, buy food without labels! I just learned that if you see the ingredient "natural flavorings" that 90% of the time it contains MSG. This is really scary since a product can claim to be MSG free on the front of the package but if that flavoring has under 1mg (or whatever) a serving of MSG they don't have to count it as an ingredient. And one serving can be one little pizza roll for example, what happens when you eat 10 pizza rolls in one sitting everyday afterschool? blech!